What is the Safest Lane Position a Florida Bicyclist Should Ride? Most roads we ride in Florida are what the law refers to as “substandard lane width” in that they are too narrow to allow a car to safely pass a cyclist while affording the minimum three foot safe passing distance. When cyclists hug the right edge of the road, they invite motorists to try and squeeze through. This puts the vehicle much too close to the bike and endangers the cyclist. In most situations, the safest position is to ride in or near the groove created in the travel lane by the right wheel of vehicles. This position puts the cyclist into the lane and forces motorists to make a distinct move into the oncoming or adjacent lane while passing, this is much safer for the bicyclist. This may seem counter intuitive to an inexperienced rider. The Orlando Area Metropolitan Planning Organization (OAMPA) has studied these issues using data from the Orange, Seminole and Osceola counties, which includes the cities of Orlando, Sanford and Kissimmee and other surrounding areas. The OAMPA concluded that lane position by a cyclist is an effective safety countermeasure for a number of common vehicle crashes involving bicycles. Vehicle making right turn from a stop sign. In each of these situations, the driver is scanning for oncoming vehicles which could present a danger to themselves; they are not alertly looking for a bicycle. An approaching bicycle which is hugging the right edge of the curb is not easily seen by a driver making any of these maneuvers. However, when the cyclist rides well into the right lane, rather than right on the curb, they are more readily seen and identified by the driver before they make their turn or proceed into the cyclist’s lane of travel. 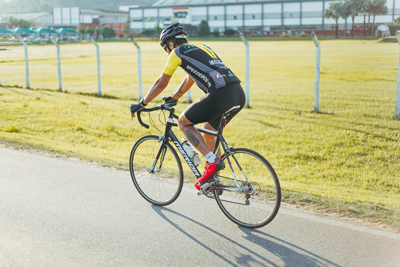 Clearwater Bicycle Injury Attorney Jim Dodson represents people who have been seriously injured in all types of bicycle crashes as well as survivors of those who have died riding a bicycle. If you have been injured by a negligent driver, or have lost a loved one because of a driver’s mistake, I encourage you to get Jim’s FREE consumer guide: Florida Bicycle Accident Handbook. Contact us online or call our office directly at 727.446.0840 to schedule your free, no obligation consultation.